” When someone admires something I have made, most times they will very sheepishly add: “I can’t sew. You are amazing. I should really learn…” They feel so horrible about themselves because they have never (up to now) produced a wearable garment. Why is that? When I find myself in conversation with a cheese-maker or a brick-layer I don’t feel bad about myself for not mastering those crafts. Why do women (it is usually women) feel so embarrassed that they can’t or don’t sew? I am not sure about this one – an interesting question. What do you think? I suppose the answer lies in women’s traditional role as mothers and housewives. 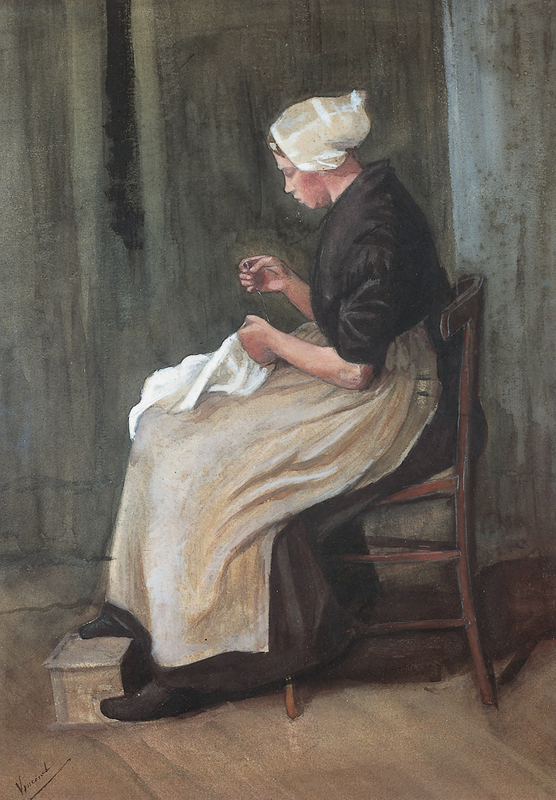 Certainly, from what I have read, since the industrial revolution women have always done the domestic work – cleaning, making, washing and repairing clothes for the family; preparing, preserving and cooking food; and caring for children, alongside work that was close to home – looking after the animals or growing food, chopping wood, repairs and maintenance. In modern society most of this work is specialised, socialised and commodified. Schooling, elder care, the provision of energy, food and clothing, is no longer in the hands of the household, but is generally bought in. Our food is processed (how many can brew beer or pluck a bird?) and most of our clothes are bought from shops. Women are alienated from some of the most basic roles they once assumed. Freed from the burden of domestic drudgery, a result of large scale industrialisation, even the working classes found that they had leisure time. Now we spend our spare time cooking, looking after the family and the house, and buying things from shops, but we may have a little time left over for ourselves. No longer required to produce our own meals and garments, grow our own food or make our entertainment, some of us choose hobbies like cooking, dressmaking or allotment holding. As it is no longer necessary to fatten the pig for slaughter, nor to weave our own bed sheets, these tasks now becomes a pleasant pastime. For the keen home dressmaker, constructing a blouse or jacket can take many hours. A factory can do it in minutes, but we take weeks (well I do!) to make something nice. This is not about economy. It may be about fit, style, non-exploitation, taste and preference. But essentially, it is a leisure activity. As Mary notes there is nothing inherently good or bad about making your own clothes, or growing your own food. Being a really great cook, or a competent dressmaker takes time. I know I am still, compared to a professional, an absolute beginner, and learn every single day. The problem arises when people who enjoy these things, and become rather good at them, adopt a haughty, superior attitude. That sourdough loaf or a hand-knitted mohair jumper is seen as somehow morally superior to things bought from Marks & Spencers. Then rather than it being our pleasure and preference, sewing our own wardrobe becomes a matter of proving that you are a better person. Instead of spending hours watching The Sopranos, we spend hours basting two bits of fabric together. There is already too much competitive behaviour and envy in the world without allowing it to encroach on our sewing! We dressmakers don’t have the high ground. We simply choose to spend our spare time on something that we enjoy. Others like to sail, or ride horses. Some like casinos and fine wines. Many people enjoy long healthy walks with a dog. And lots of us, often me included, feel so exhausted by work, kids and life that watching TV or going to bed early is the best we can do. We all need to be kinder to each other, and ourselves. I’ve never met anyone embarassed by the fact that they can’t sew. It’s sometimes a prelude to a request for free labour. Sometimes, the overtones are distinctly a put down. Maybe things are changing slowly? It’s interesting…I never get this reaction. If anything, the fact that people know I am interested in knitting and sewing seems to make me more accessible, softer to them (because of the specific specialty of my work, in doing large calculations, I seem to be an oddity to some). I wonder if it’s largely older women who feel guilty about not sewing? Many of my clients my age apologize for not being able to sew. Younger ones blame it on the school system for cutting that skill out of the curriculum or having a mother who never taught them. They see it as a magical thing they never acquired. I try to ease them by saying, it is my passion and the good Lord did not give me any other talents like singing or dancing ability. I tell them I would rather be sewing than cooking or cleaning and certainly not everyone is cut out to sew, it just happens to be something I love. Lots of women here go to Master Gardening classes and swing or square dancing or art classes and knitting classes or beer making classes…that is their passion. I tell them that I am lucky that my passion can also be my business but it leaves little time to pursue all the things that they can do every day so they are the lucky ones too. Like you, Kate, I can appreciate meeting women who are cheese-makers or woodcarvers or horse-riders and marvel at their skill and passion but don’t feel less a person for not being like them. We all have gifts that need celebrating…some days…well lots of days I wish I just had the time to sit and stroke a cat…if I had one. Thanks for bringing up this question! I have to say I have never had that reaction, either. Different type of friends? Nor have I personally met anyone who feels or acts “superior” to others because of their enjoyment of a craft, whatever it may be. Perhaps my introverted lifestyle contributes to this. I don’t know. I love Liz’s thought, “It isn’t rocket science. Just devotion.” So true! 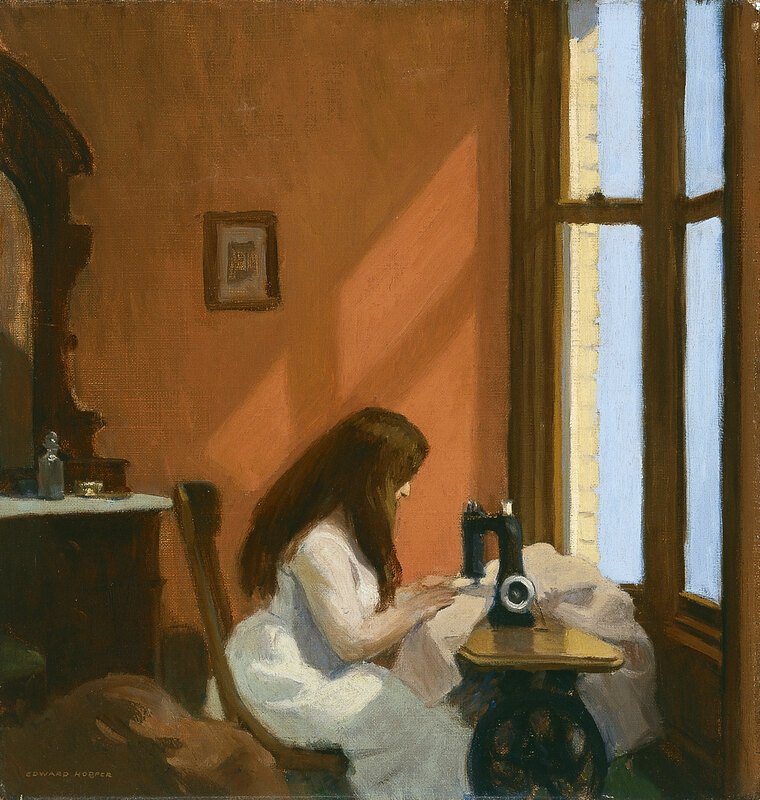 In my circle of acquaintances I’m more likely to get the put-down type of response, the “I have much more important things to do than SEW” , rather than an envious or wistful reaction. Usually doesn’t bother me, altho I have a family connection….well, some people have a toxic tendency in many things. Perhaps regional? This does seem to be something of an arrogance pocket. Since I do it for me not for them any reaction is fine…..
Well, I think that response is a kind of envy or desire to have what sewing can accomplish in the best of situations–clothes that fit from beautiful fabric uniquely chosen for the project. Many people want that. I never broadcast that I make my own clothes, unless people ask. I get both- the ‘oh, you can’t afford to buy things’ and the ‘forgive my deficiency in the womanly arts, I shame my gender’ comments. I wonder if it’s a generational difference in responses- older people remember seeing as function and economy, perhaps? When people speak to me of my sewing, it is often viewed in awe, then a knee jerk reaction of envy, and they usually end up telling me they don’t have the time, to learn. Others we know me very well, give me the impression that they think I’m wasting my time and should be doing more “important, or value able ” art. They like to think of me as an “artist”, not a seamstress I suppose! I do consider sewing an art form. It takes the same decision process , creative process , the elements of design, colour theory etc, and the result is soft sculpture. I don’t understand or appreciate the huge approval when I create stone sculptures or paintings, and none for sewing fashion garments! I really don’t understand how sewing is seen as less of an art form? It’s an old debate, what is art? My fashion sewing does serve a function, I can wear it….I am the armature…..but it’s still art, in my opinion. It’s still a creative outlet . Most people tell me they would love to be creative and make fine art , paintings for example but they don’t have the talent! People…there is all kinds and levels of art. I personally like to make something, and it can be anything, a painting a stone carving or a pair of pants. I’m most happy when I am making something, and I know this about myself. It’s who I am. I also think being an artist is a lifestyle. Kate, your definitely an artist in my opinion..and a very active one , teehee. Oh, and sewing , like reading can be seen as leasure, I totally agree with that one….but I’d rather sewing or reading then watching tv. Because, well, isn’t this how we enrich our lives….through the arts? And I hope that doesn’t sound high brow…that’s not my intent. Different strokes for different folks. I don’t like sports! Fascinating post! Reading through the comments, I’m surprised by the differing opinions. But why surprised? Sewing is an art, and art is a very passionate and personal endeavor. It’s funny the responses people get from their own creations (I don’t get any yet, because I’ve created only 2 garments, one of which I’ve yet to wear – starting over, you know). My own sister, whom I love dearly, said when I gushed over my new sewing machine, “ugh. now you have to sew.” HAHA! That was the plan, my dear. Interesting post with so many views and reactions. I haven’t had either the put down or the embarrassment. Many of the people I’m in contact with have sewn in the past but don’t now, for various reasons. As Stephanie said, I think having sewing as a hobby makes me more accessible. Apparently I’ve changed considerably since I retired! (removal of considerable stress!!). I took up bridge, too; I still have a lot to learn, and enjoy learning and playing in a group. I rarely tell people I sew, because much of the time I get the sad looks that seem to say “You poor thing, what a shame.” Once in a while, I get someone who thinks I am a wizard. Regardless of the response, I get too many people asking me to do alterations, so I just keep my mouth shut. Except on the Internet. I enjoyed your post and the responses. I did a lot of hand work and embroidery at one time, and one aunt wondered if I didn’t find it tedious! There are lots of odd reactions to the new knowledge of sewing ability. I always point out that whilst I am talented in all the domestic dark arts there are lots of things I have no capabilities in at all. It is good to see that some of the younger generation who didn’t get the opportunity to learn at school are learning from other sources now, and enjoying their results.